The National Commission for Refugees (CNR) of the Democratic Republic of Congo (DRC) announced on Tuesday in Kinshasa that out of the expected number of 18,549 Congolese refugees residing in Zambia, 14,419 were repatriated to the DRC in 2009. CNR pointed out that 12 more convoys will be organized from now till the end of the year to attain the expected figures. Since the beginning of this operation of repatriating Congolese refugees from Zambia in 2007, 34,550 have returned to the DRC through Katanga province. 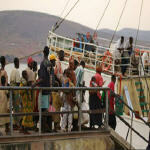 According to CNR, the DRC has taken measures to protect them and integrate them back into society. These actions are being undertaken by several partners, including the United Nations High Commission for Refugees (UNHCR), an NGO called Humanitarian Action for Africa and the German Technical Cooperation agency (GTZ).